The NOW Project: time, space and place. Extracts from a recent landscape art submission to Morecambe Bay Partnership. 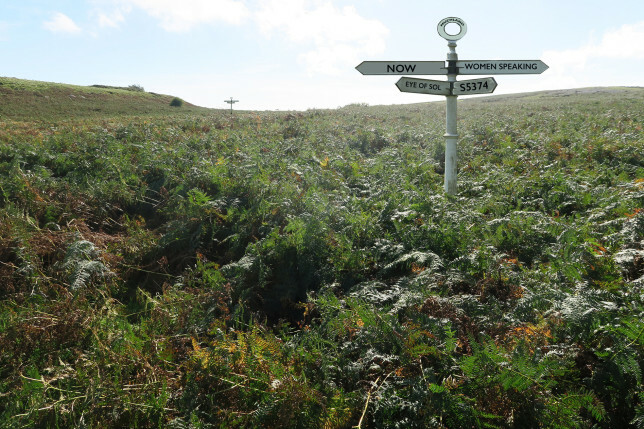 During October 2017, I undertook a programme of site visits and detailed research, in response to an open call by Morecambe Bay Partnership for permanent and temporary landscape art commissions, at sites around Morecambe Bay. The commissions are part of their ‘Headlands to Headspace’ Project (H2H), and their brief called for artworks inspired by the landscape of the Bay that will celebrate and aid people to engage in, its cultural or natural heritage. The importance of opportunities for local communities to take part in the development of artworks through activities such as public consultation or workshops, was emphasised, to develop a sense of ownership and inspire a new connection to local heritage and heritage sites. By tapping into the genius loci – the qualities or spirit of this place, I developed several interrelated concepts for community participation and landscape art interventions. A proposal, The NOW Project was submitted to Morecambe Bay Partnership at the end of October 2017. Please note that images used in this blog entry are concept visualisations, only. The tidal flows, rippling, shining sands; estuaries, headlands and farm lands, sacred sites and places of work, merge the enduring and the ephemeral, connect human and non human worlds. The creative approach and concept was inspired by the character of the land itself and the many layers of connectivity that can be seen and felt in this magical and uniquely beautiful, time swept landscape. Here is a selection from The NOW Project. Each item/component has been designed to connect in time and space, to create future facing legacy, that is responsive and sensitive to the area’s heritage. I wanted to stimulate intrigue and participation, and prompt fresh new stories that draw on local history and heritage. In this blog entry I’ve included some of the core ideas from the submission, but not all, and added in some others, for good measure. I learnt that ‘Muchland’ was the name of a medieval manor in Low Furness on the north coast of the Bay. Today, the name seems to summon up a land of plenty. 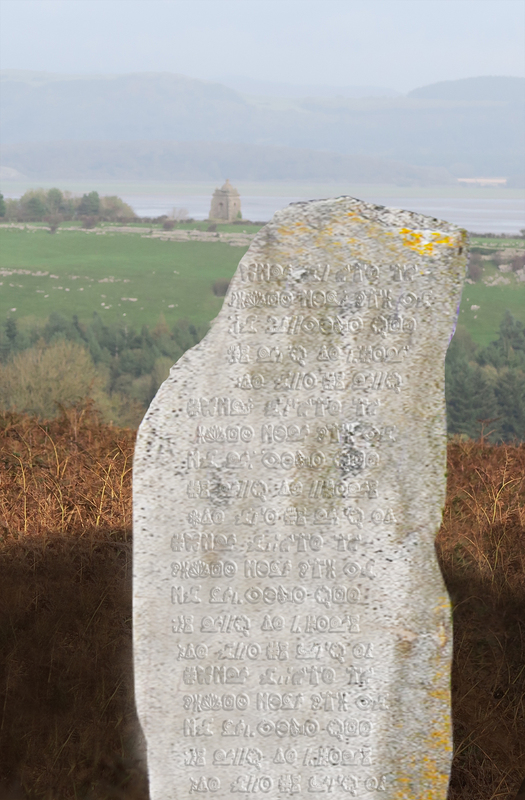 Once the seat of the Lords of Aldingham, Muchland incorporated the rocky promontory called Birkrigg Common, near Ulverston. From the Common there are stunning views all around the Bay, over Furness and into the Lake District National Park. In Birkrigg’s Muchland I proposed vintage road signage to reveal interwoven threads of myth, legend, history and memory. The signs are deliberately ‘out of place’ with an archaic, puzzling presence, as there are no roads or any need for traffic rules in this area of common land. 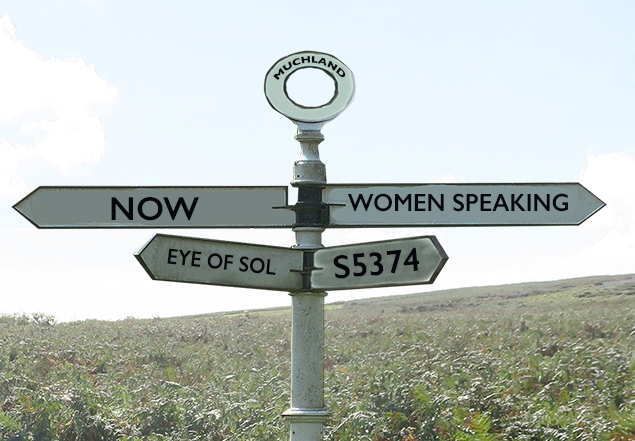 Although the destinations on the signs relate to actual sites and histories, place names are intentionally cryptic. Through this blurring of fact and fiction, an atmosphere of ‘magical realism’ will be fostered to open up imaginative interpretations, detective work and exploration, creative writing, map-making or story telling by visitors. is the unique number of the flush bracket or benchmark, of the Ordnance Survey triangulation station on the Common, whose National Grid Reference is precisely known. Trig points are slowly disappearing from the UK countryside as their function has largely been superseded by aerial photography, digital mapping, and the use of lasers and GPS. 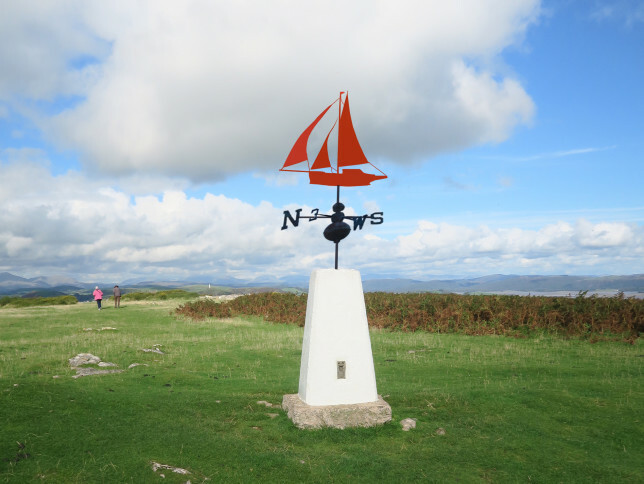 The example shown, is one of several suggestions to repurpose the trig point by cross-referencing it with a weather vane to sense and evidence the direction of the wind. The design integrates the silhouette of a traditional “nobby”. These inshore sailing vessels have been used as fishing boats around the coasts of Lancashire and the Isle of Man, since the 1840’s. With the addition, the trig point is transformed into a ‘shrine’ to the wind. Image: genius loci, the ‘Spirit of Birkrigg’ (2017). According to Norse mythology, ‘Sol’ was goddess of the sun. The digitally created image above, is an imagined portrait of Sol that I made after walking around and experiencing the area. 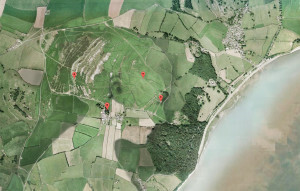 I adapted a Google satellite view of Birkrigg Common, by digitally adding simple elements and shadow. 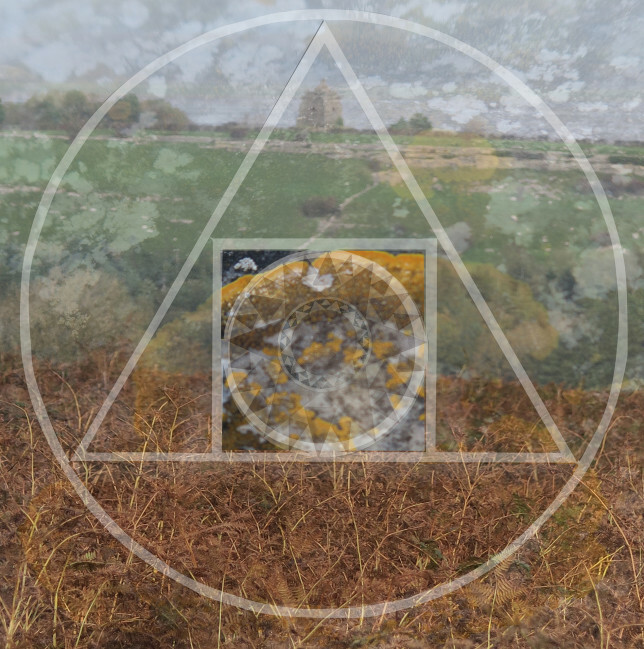 I placed Sol’s ‘eye’ at the Druid’s stone circle, from where networks of ‘neural’ pathways radiate. The ancient sites higher up on Appleby Hill and the limestone ridges, became her ‘forehead’ and ‘cranium': where memories lie beneath the surface. The OS trig point is situated towards the rear of the ‘head’ land. Sunbrick lies to the southwest of her ‘ear’ (see ‘Muchland’ map pins below). Bardsea can be seen to the northeast. This attempt to envision the ‘spirit of place’, has been influential in the approach to the project. 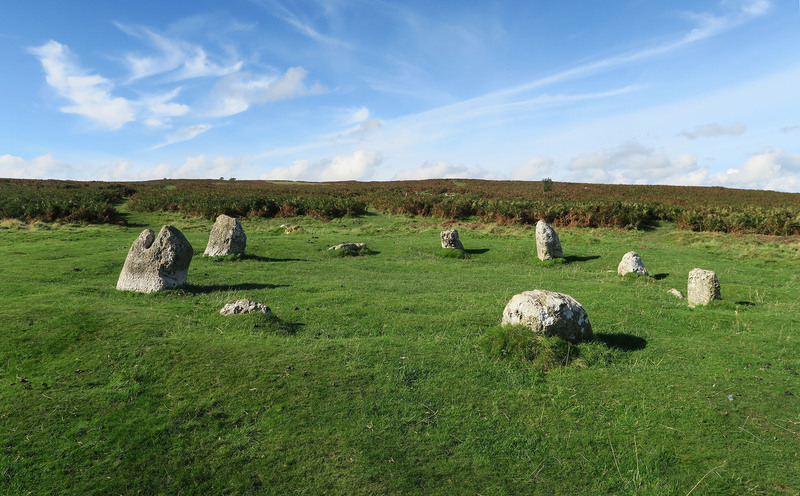 Like other standing stone configurations in Cumbria (and indeed throughout the world), the Bronze Age circle at Birkrigg exudes an ancient mystery and its functions of ritual, alignment and communion with universal elements. 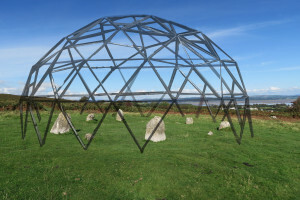 This proposal involves the fabrication of a temporary geodesic structure, whose geometry is derived from the dimensions of the ancient circle, to encompass the inner ring of stones. A system of small mirrors or simple heliostats placed around the apex of the structure will allow a moving ‘sun spot’ to form on the ground within. 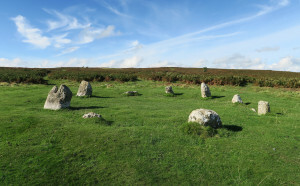 Depending on the angle of the sun overhead, the movement of the spot of light around the twelve stones will draw attention to the Earth’s rotation, and convert the circle into a kind of clock or sundial, or a ‘temple’ to the light. Mindfulness is the practice of bringing one’s attention to experiences occurring in the present moment. Research has found that when people intentionally practice being mindful they feel less stressed, anxious or depressed. On ‘Bay Day’, participatory workshops and playful art making, employing drawing, craft and map making, story telling, photography, making collections of found objects and materials, audio or video recordings, will reveal ways that this unique environment shapes people’s lives. Symbolic communication, cross-reference and geometric alignment will be additional generators of process. The NOW team of artists and community volunteers will continue to work together to distill the Bay Day material, turning heritage into art. A series of linked exhibitions will present the resulting artworks at unconventional venues around the Bay, indoors, outdoors, and online, during the H2H summer festival in 2018. The exhibitions will convey a multifaceted, kaleidoscopic ‘moment in time’, by sharing contributor’s experiences, collected on a single day, here, and NOW. Taking a lead from the ancients and from recent research into mental health, a new, permanent landmark is proposed, whose legacy will be to celebrate the NOW Project’s ethos of mindfulness: of being more fully present in the moment. Referencing the area’s geology of limestone, sandstone and slate, three stone monoliths will be placed in geometric alignment to specified locations around the Bay, to create a contemporary earthwork, or henge (images below). One of the stones will bear the deceptively simple inscription ‘NOW’, expertly carved into its surface by a local mason, once in situ. Via a process of creative engagement, a story or message will be devised by the local community, about living NOW. Together, we will create an ‘alphabet’ of expressive symbols to communicate the message, which will be inscribed into the other stones. The monoliths, each standing over 15 feet high, and their site, will become catalysts for multi-context observation: a landmark from which to make new connections, both spatially and metaphorically, and to engage with the poetics of time. They will also act as reminders to passers-by, to be mindful and to more fully inhabit the present moment. Especially those who may be feeling weighed down by the past or fearful of the future. We intend that the ambiguous sense of alignment, the awesome size, weight and enduring qualities similar to those of ancient standing stones, will activate inventive readings and contemplative, spiritual encounters. By embodying both transience and permanence, the landmark will become an enduring memorial to the present moment. 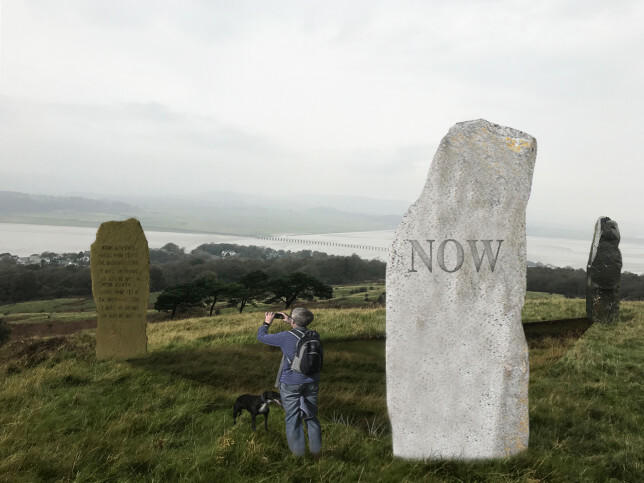 In the concept sketch above, the location is a National Trust area close to the summit of Arnside Knott where there are views across Morecambe Bay in one direction, and the Kent estuary in the other. Soft, sunken landscaping referencing archaeological dig technique, emphasises the geometry of the site. A winding, paved pathway, incorporating the three types of local stone in a series of stepped sections, will lead up to the site. The example below, indicates how the community inscription, made up of bespoke symbols – contemporary ‘hieroglyphics’ – will have the potential to connect over thousands of years, and convey an enduring message celebrating life, in this place, NOW. 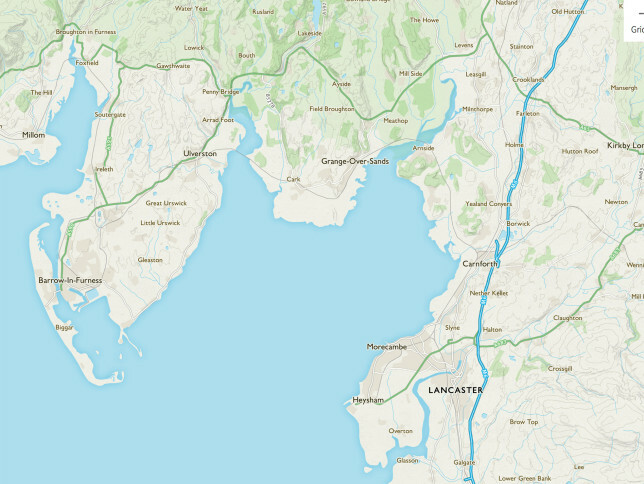 The NOW Project, Morecambe Bay. October 2017. Going back in time… a chance to look at two projects from the archive.